The value-based approach to strategy argues that a firm’s ability to capture value depends on the extent of its added value. 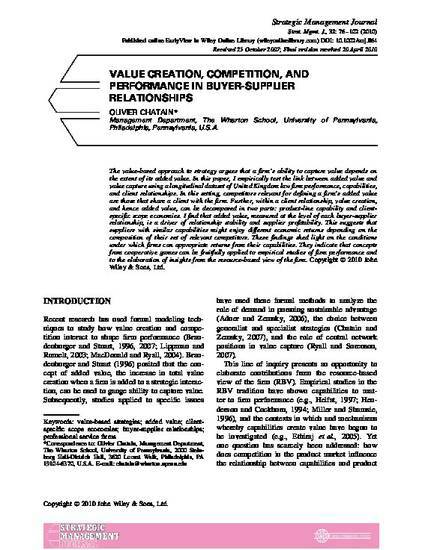 In this paper, I empirically test the link between added value and value capture using a longitudinal dataset of United Kingdom law firm performance, capabilities, and client relationships. In this setting, competitors relevant for defining a firm’s added value are those that share a client with the firm. Further, within a client relationship, value creation, and hence added value, can be decomposed in two parts: product-line capability and clients-specific scope economies. I find that added value, measured at the level of each buyer-supplier relationship, is a driver of relationship stability and supplier profitability. This suggests that suppliers with similar capabilities might enjoy different economic returns depending on the composition of their set of relevant competitors. These findings shed light on the conditions under which firms can appropriate returns from their capabilities. They indicate that concepts from cooperative games can be fruitfully applied to empirical studies of firm performance and to the elaboration of insights from the resource-based view of the firm.